For students planning to attend VIZBI 2016, EMBL is offering a limited number of CPP fellowships, which provide registration fee waiver and/or a travel grant for up to €400 for participants travelling from the European continent and up to €1,000 for participants travelling from outside Europe. Fellowship applications close 6 January 2016. 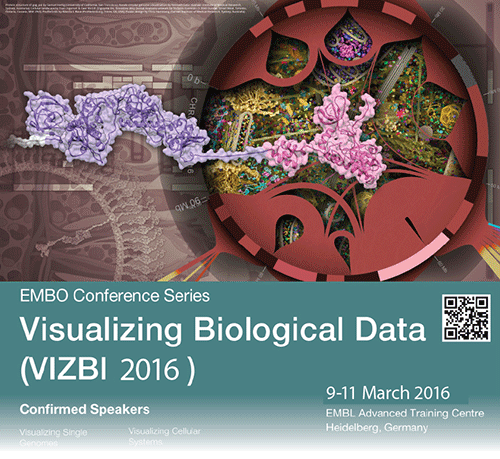 We are delighted to announce VIZBI 2016, the 3rd EMBO Conference on ‘Visualizing Biological Data’, which will also be the 7th international meeting on this topic, to be held March 9-11 at the EMBL, Heidelberg (Germany). VIZBI 2016 brings together scientists actively using or developing computational visualization methods to study a diverse range of biological data; the conference also encourages participation from medical illustrators, graphic designers, and graphic artists. VIZBI 2016 will feature keynotes from Fred Brooks, Kwan-Liu Ma, and Gaël McGill plus 18 invited talks from high-profile speakers who will highlight visualization challenges in rapidly emerging application areas within life sciences, biomolecular engineering, and ecology. All VIZBI participants have the opportunity to present a poster and a lightning talk describing their work. If you cannot join us in Heidelberg, you have the option of virtual registration, which allows participation via streaming video and chat. Tutorial proposals. Prior to the meeting (March 8), there will also be half-day tutorials on visualization tools & methods. If you are interested in running a tutorial, you are invited to submit a tutorial proposal. The deadline for proposals is 1 November 2015. Sponsorship. If you are interested in promoting your organization or professional society, a range of sponsorship options are also available. The first six VIZBI meetings have been very lively events, and have helped foster a new focus on data visualization in the life sciences. VIZBI 2016 promises to be another exciting event – we hope very much you can join us!